Now it is time to experience the mysterious power of 'Splite Golfy'. Every hole in this tour has water hazard. But no need to worry at all, because all of you can play with 'Splite Golfy' for FREE! 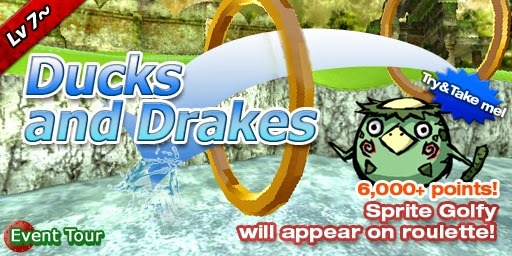 Also you will get additional 1,000 points every time your Golfy go through the rings! 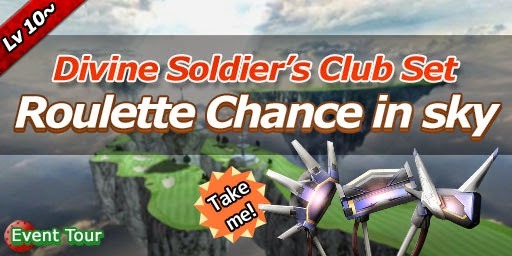 If you get 6,000+ points, we will also see the 'Splite Golfy' on the roulette! The winner's prize is 'Muramasa's Club Set'. Let's try the holes high in the sky! If you get 4,500+ points, you will see the S-classed club: 'Divine Soldier's Club Set'! The winner's prize is also 'Divine Soldier's Club Set'. The all-birdie prize is 1 Slime Ball.